Small actions can lead to large gains in farm profitability. Kristjan Hebert is Canadian farmer who has presented on a farm improvement framework he calls “The 5% Rule”. This is a simple rule where farmers should aim to increase yield and price received by 5% and decrease expenses by 5%. I should note that we have no affiliation with Kristjan or any of his business interests (I simply really like his business philosophies). The small 5% improvements have a large compounding effect on farm profitability. This rule/mindset is the backbone of a great farm business. It’s not something that can be acheived overnight. It’s a long-term, ROI-focused approach to business decisions. See below for a simple illustration on the power of small, incremental improvements using soybeans as an example. See below for a great presentation that Kristjan gave on this topic. I particularily enjoy his commentary regarding cutting expenses and increasing efficiency while focusing on not hurting your yield prospects. I call this “trim the fat, not the muscle”. While I love this concept, there is one point that I would like to build on. I think producers need to be careful with the goal of increasing price by 5%. Every successful business tries to maximize revenue. Increasing pricing in a major component in achieving that. But most businesses are not farms. The truth is that a commodity-based business is a price “taker”(at least from a futures market standpoint). Individual producers have no control over futures prices. It’s dangerous to get stuck in a cycle of always wanting 5% more. My 5% rule clarification: Get 5% more by maximizing the basis and carry on your futures sales/hedges. In the video shown above Kristjan alludes to the fact that most farms don’t separate the futures and basis side of their sales. I agree with that but I want to add some additional commentary on the increasing price component of the 5% rule. Set the futures price when that price that work for your farm’s financials. This often occurs during the growing season when your crop is in a state of uncertainty. That’s the reality of farming. Ignore the dozens of market predictions that are thrown at you every week. Make store vs not-store decisions by the amount of carry in your specific commodity market. Set the basis on your futures sales when your local market is hungry for your commodity. Click here for a blog post on maximizing storage ROI. I will admit that the steps listed above are much easier said than done. But running a farm is not easy. Make strategic investments in your farm business that will allow you to better accomplish these steps. In any aspect of grain marketing, there are no certainties. Just like on the agronomy side of your operation, use a probability-based decision making process. It’s common sense that you’re rarely 100% certain that an incremental input purchase will produce a positive ROI. You make your decision based on the probability of said purchase giving you that positive ROI. We need to apply that same logic to our marketing. Agricultural commodity markets tend to price in risk premium when the future crop size is in question. This tends to happen from March-July. Once the market is comfortable with the crops size, we can quickly see risk premium come out of the market. Once again, nothing is a certain but over time the market offers risk premium before and during the first couple months of the growing season. Be aware of this seasonal pattern. See below for a video I produced for a now-closed course we offered this past winter. Another important consideration is the fact that we can’t change past decisions. If you sell 20% of your wheat the day before the market goes up $.20, it’s over and done with. Don’t dwell on it. Kristjan hammers home the point that farmers need to measure their profitability on an accrual basis. Doing this focuses a farm on the fact that higher prices are great! Don’t let a fear of higher future prices stop you from making a sound marketing decision today. Furthermore, there’s a popular quote in business that states, “What Gets Measured Gets Improved”. Accrual-based accounting allows a farm to meaure their profitability on a crop year-basis rather than simply monitoring the cash flow. A farm’s cash flow can be a dangerously lagging measure of farm profitability. Measure your farm’s profitability on an accrual basis. Our mission at Harvest Profit is to help farmers make more profitable and less emotional farm business decisions. The building block of this process is providing tools that allow our users build and track real-time accrual-based farm financials. 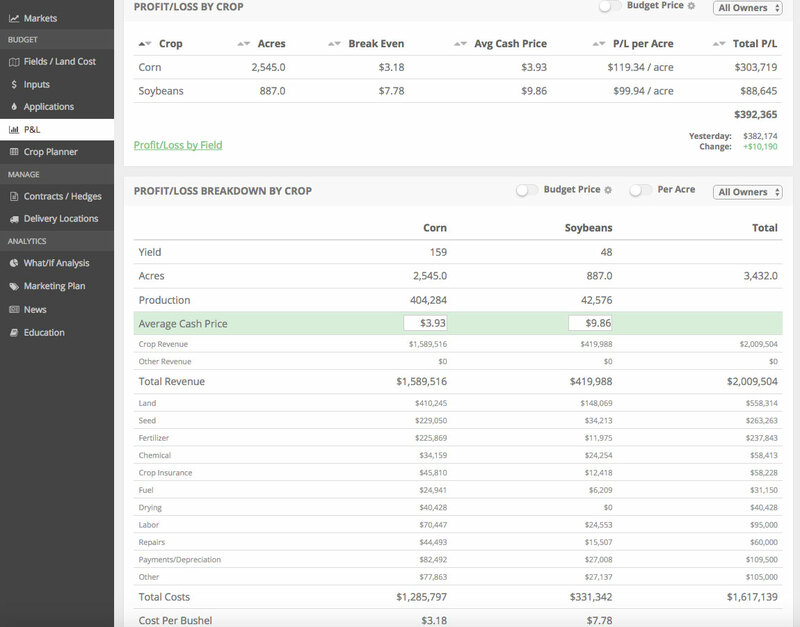 Click the button below if you’d like to try a demo of the software to better manage your farm’s P&L. In summary, every business decision needs to be approached from an ROI-standpoint and a farm business is no different. If you focus on making small, incremental improvements to your farm it will pay big dividends in the long run. If you enjoy content like this, sign up for our free weekly newsletter below. Disclaimer: The information contained herein was obtained from sources believed to be reliable, but can not be guaranteed. All examples given are strictly hypothetical and neither the information, nor any opinion expressed, constitutes a solicitation to market commodities or buy or sell futures or options on futures. Commodity marketing and trading is risky. Trading and/or marketing decisions and any trading and/or marketing gains or losses are the responsibility of the commodity owner, producer, and/or account holder. Harvest Profit, Inc., Market Wise Ag Services LLC, it’s principals, and employees assume no liability for any use of any information contained herein.